The third pillar in our strategy as an Association is Multiply. Here, our aim is to assist pastors and churches to be intentional about making disciples and raising up leaders and sending them out. We come alongside in this area in a number of ways through our partnership with the Florida Baptist Convention, helping churches figure out how they can identify, equip and send pastors and missionaries to plant the gospel and establish new churches. Tampa Church Planting is the hub of our church planting efforts. It is overseen by our Director of Mission, Mike Kahn, and his Church Planting Catalyst, Robert Beckman. If you are interested in church planting in Tampa Bay, we want to invite you now to contact Robert (863) 660-1333, rbeckman@tampachurchplanting.com. We have been blessed over the last two and a half years through our partnership with Barry Whitworth and the North American Mission Board's church planting team in the City of Brotherly Love. 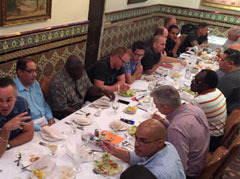 Pastors, church planters and revitalizers gather occasionally for fellowship, encouragement and practical helps.